I hope that the new year brings you health and happiness and all the good things that you wish for yourself and your family. I decided that I would start the new year with a new knitting project and it's FROM MY STASH. My knitting goal for the year is to knit projects that I have on hand, so knitting from my stash should be a recurrent theme. First up is the Ramona cardigan, designed by Elizabeth Smith. It's a basic cardigan, which means that it'll be practical for home and for work. It's knit from the top down in one piece so there will be minimal assembling and sewing. 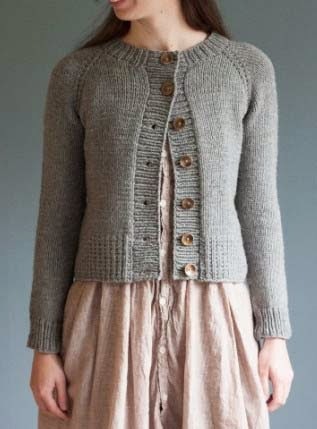 The pattern calls for an aran-weight yarn and "Osprey" from Quince & Co. is suggested. I bought the yarn in October, choosing color #112 Pomegranate. I swatched last night and got gauge on my first try. I love it when that happens. On knitting the swatch I found the yarn to be fairly dense and rigid, but when I washed it, the yarn softened and relaxed and it felt very nice. With this weight of yarn the sweater is progressing fairly quickly. After only a few hours of knitting, while watching the Colorado Avalanche hockey game (winning 5 to 3!) I've finished the yoke section and I'm ready to knit the body. I'm thinking that I might make the cardigan a bit longer and I bought an extra skein of yarn. It won't be long and I'll be shopping for the perfect buttons.